Bourjois launches Happy Light, a new range that lights up the complexion for a radiant effect, without a shadow of imperfection. With these beauty allies, a flawless, radiant complexion – in every light – can be yours. With its innovative formula and texture like a second skin, Happy Light Foundation is bound to put a smile on your face! Luminous and perfectly even, no matter what the light, your complexion will be more radiant than ever before. 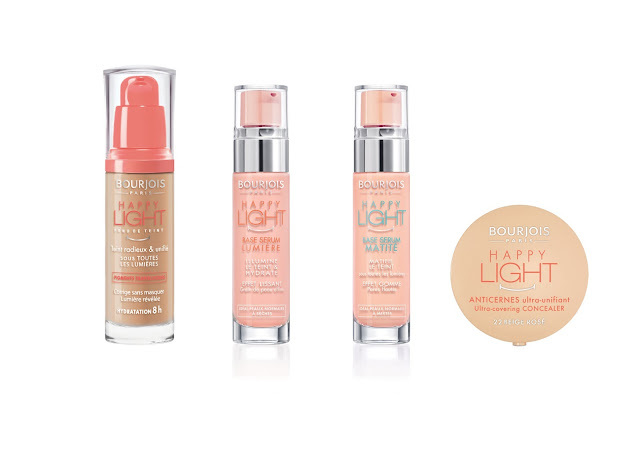 Exceptionally fine and pure, the translucent pigments used by Bourjois have been selected for their perfect affinity with the skin. Their concealing power enhances the radiance of the complexion while concealing its imperfections, without thickness. Intelligent, they absorb then reflect the light: the complexion takes on a new found radiance. The ultra-fine and soft powders contained in the formula have been specially chosen for their softness and velvety feel. The texture of Happy Light Foundation is supple and so melting that it fuses with the skin and ensures an undetectable finish, with no masking and without a heavy or oily feel. Flexible, the foundation becomes one with your facial expressions, without a stiffening feel. 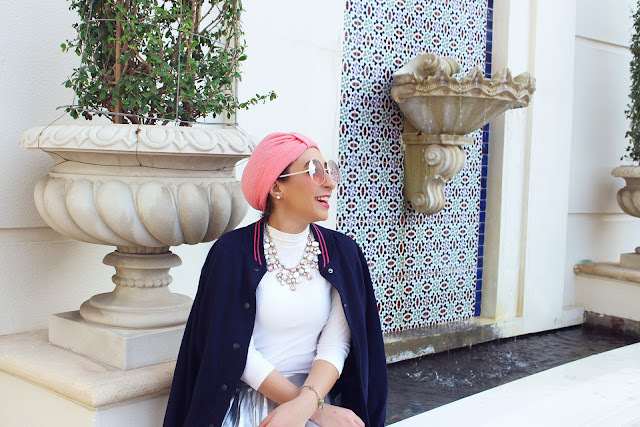 A beautiful glow brightens the face, without a hint of a blemish. Amazingly natural, the complexion is even, velvety, luminous and flawless. A sleek design, a transparent glass bottle, a coral coloured pump, silver graphics: the Happy Light Foundation pack is in itself the essence of light! Matte for normal to combination skin. With their light, melting serum texture, the Happy Light primers procure an exquisite second-skin sensation. 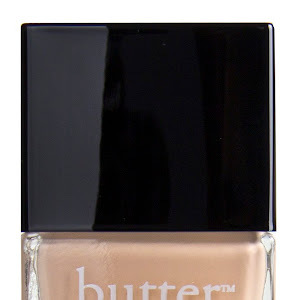 Applied alone or under foundation, they leave the skin feeling supple and plump with a refined texture. 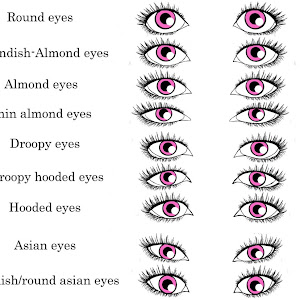 Their two universal shades illuminate all complexions. For normal to dry skin, an illuminating, moisturising version. With its light-as-air texture, Happy Light luminous primer leaves the skin soft, comfortable, moisturised and replumped. The complexion is immediately illuminated! Specially created for normal to combination skin, Happy Light Matte Serum Primer is also endowed with a treatment serum texture. It leaves the skin feeling velvety and enhances the skin texture: the pores are refined and the complexion is mattified in all lights. 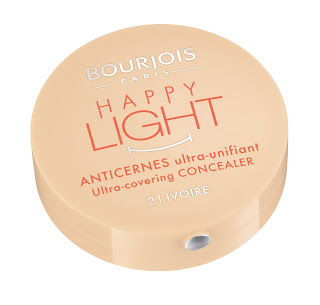 Bourjois launches Happy Light Concealer, a compact concealer, for a spectacularly even complexion, in any light! Bourjois creates a make-up artist style product available to everyone: the ultra-supple compact texture of Happy Light Concealer enables a targeted application, using a finger or a brush. 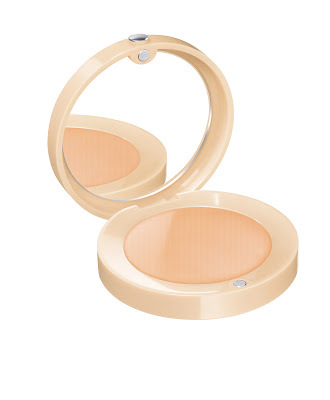 Multi-action, it conceals dark shadows and blemishes while illuminating. And even though it's the product with the greatest coverage of the range, Happy Light Concealer knows how to stay undetectable! The Concealer also has a new generation texture, sensorial and smooth. Exceptionally light, it blends totally with the skin and stays comfortable the whole day through, without stiffening facial expressions or slipping. With a single application, the complexion is revitalized and illuminated. Providing maximum coverage yet imperceptible, Happy Light Concealer hides blemishes with total discretion! The Bourjois advantage: Applied as a primer on the upper eyelid as a base, it enhances the holding power of your eyeshadow! Go-anywhere packaging that you can slip into any handbag: ultra-slim with its own mirror, so practical for touch-ups during the day! Pretty and practical, the glass mini-packs of Happy Light Serum Primers are easily identified by the colour of the pump: blue-green for matte, coral for luminous. 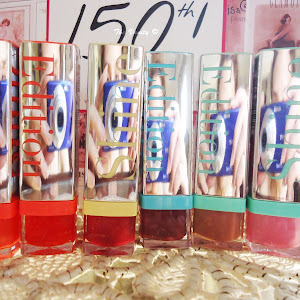 They are a perfect size for carrying in your make-up bag too. 1/ Prepare your skin with Happy Light Matte or Luminous Serum Primer. 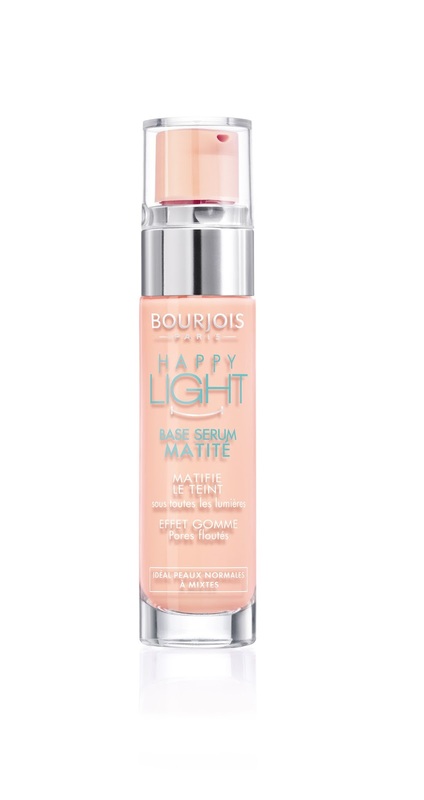 2/ Illuminate and unify your complexion with Happy Light Foundation. 3/ Conceal shadows and blemishes with Happy Light Concealer. All products in this collection will be available from September 2013.